Bind your dear ones closest to your heart by ordering for them this Admirable Silver ganesh lakshmi mandapam with Rakhi on the sacred day of Raksha Bandhan. This is Nicely Gift Wrapped Silver Plated Mandap Size 2.5 inch with Golden plated Lakshmi Ganesha idol with 1 Free Rakhi. 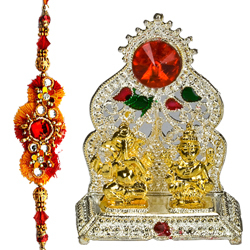 Nicely Gift Wrapped Silver Plated Mandap (Size 2.5 inch) with Golden plated Lakshmi Ganesha idol with 2 Rakhi. Nicely Gift Wrapped Silver Plated Mandap (Size 2.5 inch) with Golden plated Lakshmi Ganesha idol with 3 Rakhi. Nicely Gift Wrapped Silver Plated Mandap (Size 2.5 inch) with Golden plated Lakshmi Ganesha idol with 4 Rakhi. Nicely Gift Wrapped Silver Plated Mandap (Size 2.5 inch) with Golden plated Lakshmi Ganesha idol with 5 Rakhi. Nicely Gift Wrapped Silver Plated Mandap (Size 2.5 inch) with Golden plated Lakshmi Ganesha idol with 6 Rakhi.